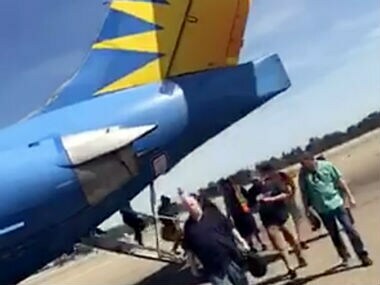 California: Smoke filled the cabin of an Allegiant Air jet after it landed at a California airport on Monday, forcing coughing passengers to cover their faces with shirts and firefighters to board the plane, authorities said. "We used our shirts to mask our faces from the smoke", he said. "I was coughing pretty good from it." At one point, the flight crew said they would pass out wet napkins to help passengers cover their mouths, Moreno said, but that didn't happen.